We know that it can be very hard to find a good pair of running shoes, a pair that is durable, comfortable, and will last you for a long time to come. There are so many models and types out there and choosing the right one for you can be extremely difficult. However, this is not to say that there are no good women’s running shoes available, but you do have to do some research. We are here today to do a Salomon Women's XR Mission Running Shoe review for your benefit. Who knows, this might be a running shoe that you really like. This is a fairly new running shoe for women, one that was not released too long ago. If you need a comfortable running shoe with a decent level of durability, this might be the best option for you. It is definitely a very colorful running shoe. If you are a woman in need of a good pair of running shoes, the Salomon Women's XR Mission Running Shoe might be right for you. This particular shoe is designed specifically for trail running, so if you like running on dirty trails, it’s a good option to keep in mind. However, it is not the best shoe out there for road running, so just keep that in mind. With that being said, these running shoes do offer a very high level of comfort, which is great if you often suffer from foot pain. To be blunt, in the box you get a pair of Salomon Women's XR Mission Running Shoes. That is it. You get the shoes, a pair of laces, and nothing else. This is standard when buying any kind of shoes. The Salomon Women's XR Mission Running Shoe does have some neat features, so let’s take a look at them right now. One of the best features that you get with this shoe is that it comes with a chevron Contragrip traction pattern. When it comes to moving forward on slippery and uneven ground, you won’t find much better than this. With that being said, this is more of a trail running shoe than a road running shoe, so just keep that in mind. On a side note, the outsole is made to be highly durable, so rocks and sticks don’t break it down too fast. To help keep your feet cool, to keep them from sweating, and so the Salomon Women's XR Mission Running Shoe does not weigh you down too much, it features a mesh upper. This mesh upper helps cut down on the weight and increase breathability, which is perfect for running. To help with convenience, these running shoes feature a quick-lace system that eliminates the need to tie these shoes, thus making life just a little bit easier. In terms of comfort, you really won’t find much better than the Salomon Women's XR Mission Running Shoe. It comes with a special EVA insole with extra padding in the heel. This means that you get a lot of underfoot and arch support, plus a lot of impact absorption too. In other words, these shoes try their best to make you feel like you are walking on a cloud. The comfort grip feature built into this shoe helps to make them flexible and work with your feet instead of against them. These shoes might be quite flexible, but they do also offer a nice level of support. One of the only drawbacks that these shoes suffer from is that the mesh is not super durable, nor is it waterproof. There is really nothing to say here. We don’t really have a tutorial on how to use these shoes. Simply find the right size that works for you, lace them up according to how tight you want them, and go for a run. Keep in mind that these are trail-running, not road-running shoes, so you should probably stay off of the concrete with them. Other than that, if you wear a good pair of thin and moisture wicking socks, you should be just fine. If you need a good running shoe that is more for road rather than trail running, we would suggest a closer look at the ASICS Women's GEL-Venture 5 Running Shoe. It has many similar features to the Salomon, but it is better for the road rather than trails. 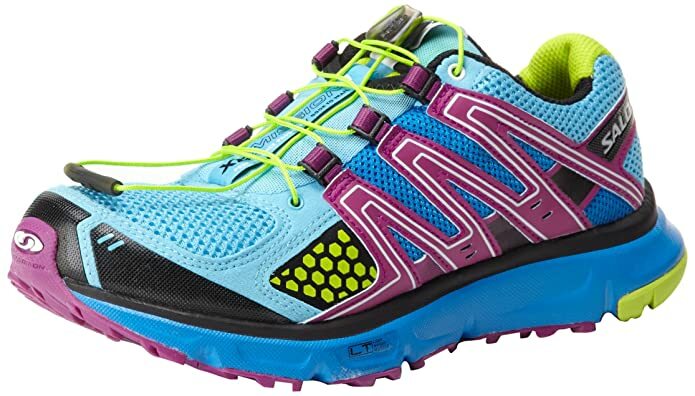 As you can see, if you need a fairly durable running shoe that is designed for trails, one with good traction, a lightweight design, and a high level of comfort, the Salomon Women's XR Mission Running Shoe is a fantastic option to keep in mind. It should keep you comfortable no matter how long you run for.